Live jamming Ableton-style, with iPads & USB MIDI controllers – Having nothing to say and saying it: my blog. MacBook Pro running OSX 10.9.3 “Mavericks”, 16GB RAM, 1TB SSD, with Ableton Live Suite configured to see Lemur Daemon and touchAble client as MIDI ins. Obviously the hardware controllers are easy to set up because they each appear in Live’s MIDI dialog in settings, and will each show as a separate MIDI in, so you can easily ascribe each to a single track (and therefore set that track to one sound). You can arm them or not, and so students can improvise together and just some of them be recording new material. Lemur on the iPad in Perform mode. Quite similar to playing pitched instruments on the Ableton Push. 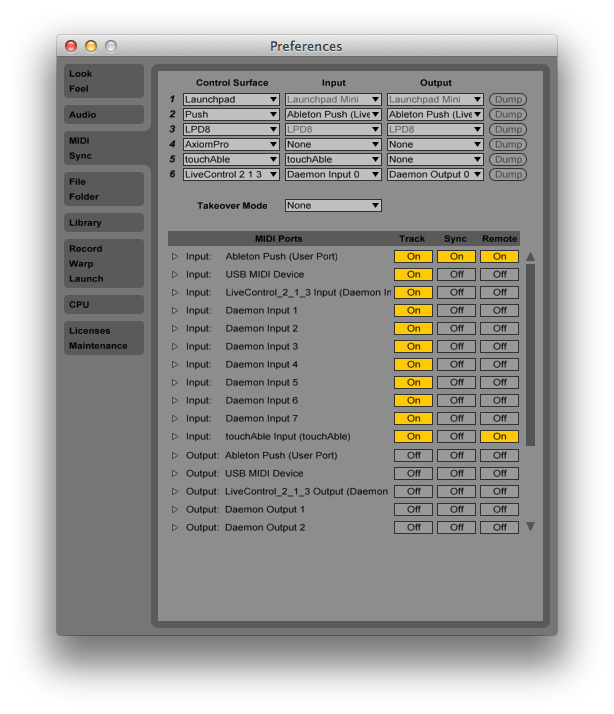 Tap More Settings and under MIDI 0 select the same Daemon Output and Input number from your Mac. *Note* do this in a really logical way, and work out some way to keep track of which iPad is which MIDI number, such as putting a sticker on the back of the iPad – so you know which iPad is which “instrument” in Live. Repeat steps B to E for up to 8 iPads (because you have Daemon inputs 0 to 8). touchAble on the iPad, triggering all clips in Live’s Session View on the Mac. Going to preferences and making sure that Live sees all of the various MIDI ins and that they’re all switched on under Track. 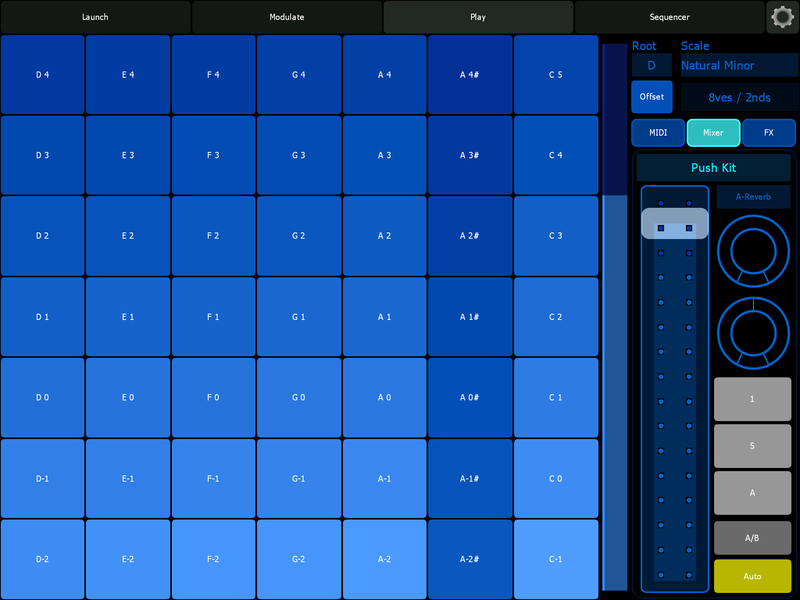 Adding a MIDI track for each instrument – that means one for each hardware instrument and one for each of the 8 Lemur Daemon inputs (if you have 8 iPads running). Dragging a different Live instrument to each MIDI track so each person is improvising with a different sound. Spend some time thinking about how the sounds will interact texturally, and also sound that work over a wide pitch range (high to low) so they’re not competing in the same frequency range. You can also pan etc. to create “space”. Test all of the inputs! Each one should play a separate sound. touchAble can also be set to play an instrument, but because it doesn’t have the multiple ins that Lemur has, I used it to control the whole session view, so some students were “DJing” the whole thing rather than performing, improvising or recording. We allocated a few tracks to each DJ. Now you’re ready to jam! 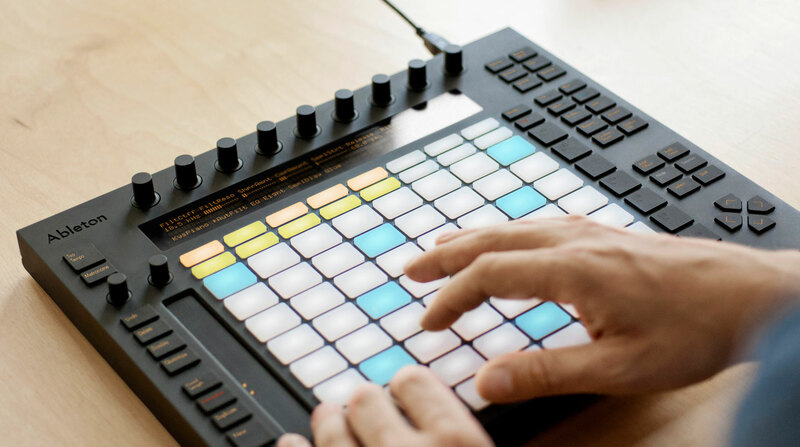 The process that I used was to show students first how to do drum programming on the Push, and used the duplicate feature to create a series of drum patterns, and then added in live drumming from the push and other drum pads like the Beatstep and LPD8, quantizing as we went. So we now had 4 or 5 live percussionists either playing live or recording loops and adding to them as they went (I facilitated this in Live). 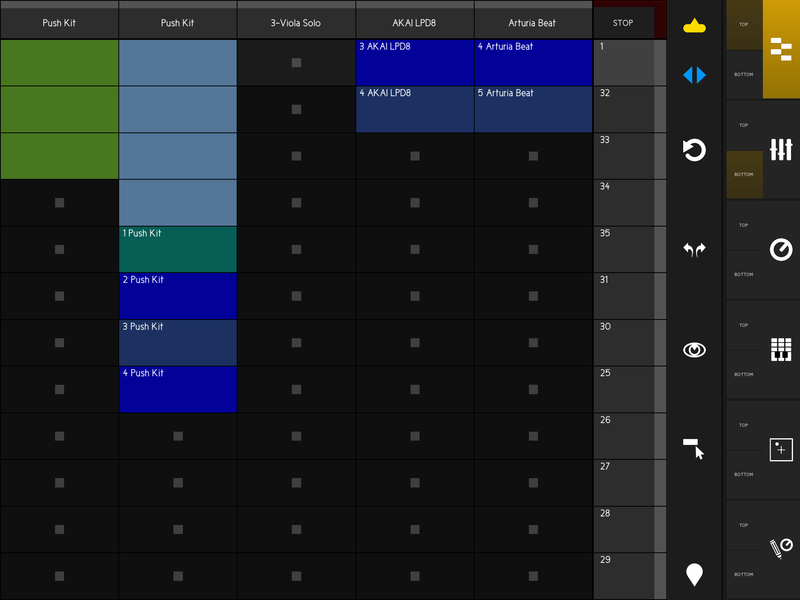 Having created a load of percussion sounds, we agreed on a key/mode for the Lemur and other pitched controllers (e.g. MIDI keyboards), and went around the room each recording a series of ostinati in that mode one after another (again, I facilitated this in Live). Next the DJs took over, running existing material and experimenting with it in different combinations, as well as arming and disarming tracks for additional live improvisation over the top (like conductors of an ensemble). To be honest, it wasn’t what I’d call amazing, but it was a great experiment, and I think with more sensitive use of the technology (and more bullet-proof MIDI-in from Lemur) something really unique could be achieved. Here’s a really short soundbite of what the students created…. Pingback: Slide2Learn conference, Sydney | Having nothing to say and saying it.